There is ample evidence to suggest that Irish harpers were greatly influenced by Baroque composers. 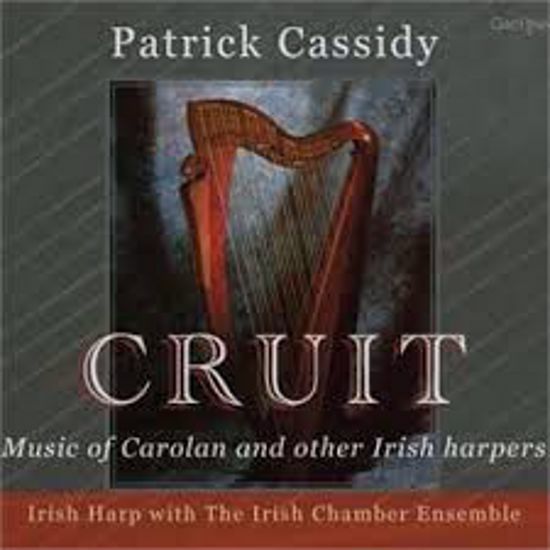 How fitting it is, therefore, that on Cruit the music of 17th and 18th century Irish harpists such as Carolan should be heard arranged for Baroque ensemble with Irish harp. The arrangements are by Patrick Cassidy, a composer of international fame. He is also uncle to the singer Sibéal Ní Chasaide who sang Patrick’s arrangement of Patrick Pearse's poem ‘Mise Éire’ at the Irish government commemorations of the 1916 Rising. The Irish Chamber Ensemble heard on Cruit comprises violins, oboes, viola and bass viol. Among its esteemed memebers are Sheila and Moya O’Grady, and Constantin Zanidache. Patrick has been awarded Person of the Year by the City of Limerick and, from Limerick University, the Medal of Honour and Distinguished Alumni Award. He currently resides in Los Angeles where, in addition to his concert work and compositions, he has scored and collaborated on film and documentary projects such as Hannibal, Kingdom of Heaven and L'Aviatore. The album Cruit (1988) has now been re-released by Gael Linn.